We use the term glazing to describe any transparent structural material, whether glass, rigid plastics like polycarbonate, or plastic films. 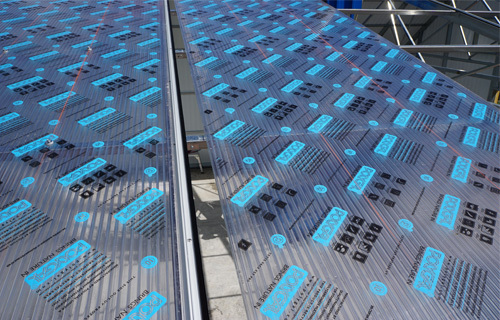 If designing your own solar greenhouse, these materials are critical to greenhouse efficiency and performance. Here are the main variables to pay attention to: light transmittance, insulation, placement, durability and cost. In our next blog we’ll discuss how to choose the best angle of glazing for your greenhouse roof and windows to maximize light and year-round growth. All transparent materials allow some light to enter, but the amount can vary drastically. A double clear glass window with no low-e coatings has a light transmittance up to 80%. That means 80% of the light that hits that material at a perpendicular angle gets through. The remaining 20% is reflected. In contrast, a 25 mm, 5-wall polycarbonate plastic has a light transmittance of 50%. That means 50% of the available light is lost…very important when light is scarce in the winter. When choosing a glazing material, research it’s light transmittance; it should be specified by the manufacturer as “visual transmittance” or VT. But we should note, what you see through the glass (visual transmittance) is different than what the plants “see” (also called Photosynthetically Active Radiation or PAR light). Coatings can block out part of the PAR light spectrum. So while VT gives you a good idea of how much light will come through the glass, it’s not the entire picture. Ask us to find out more about how to measure PAR light. 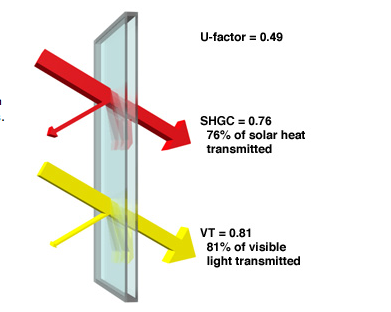 Above: Visual transmittance and heat gain through double pane glass. Below: Not all the light that plants need (PAR light) is visible to the human eye. 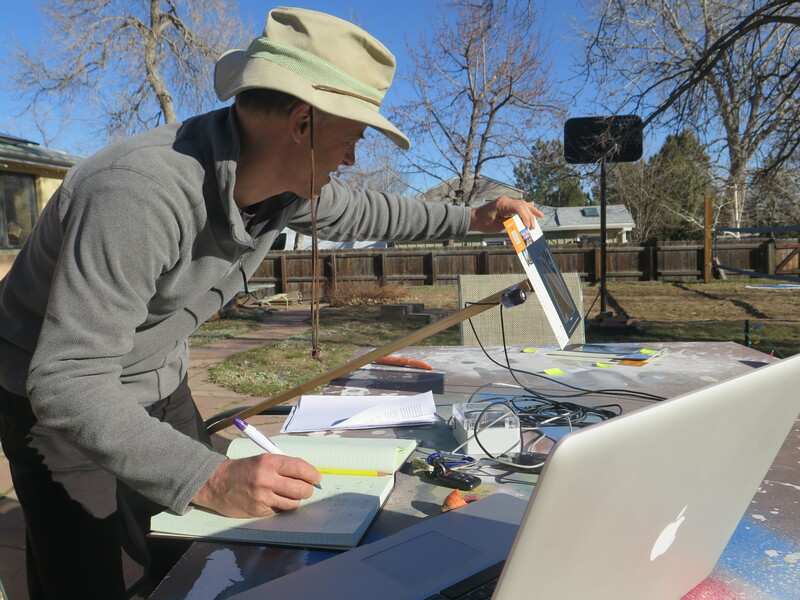 Below: Marc tests the plant-specific (PAR) light levels through a sample greenhouse film. All of CERES glazing materials are tested for PAR light, not just visual transmittance. Low light transmittance is correlated with being thicker, and thus, more insulated. The 5-wall polycarbonate has 5 layers of polycarbonate, each with an air pocket between the other. That’s what enables it to have an R-value (a measure of it’s thermal resistance, or insulative value) of 5.6. An air pocket is an excellent insulator. That’s why layering materials to create an air pocket between them is good strategy for adding more insulation. A tri-wall polycarbonate, has an R-value of 2.6. And a single layer of plastic only has an R-value of X. Thus, there is a natural trade-off between light transmittance and insulation. Most year-round greenhouses in cold climates need both, and so choosing the right material becomes a delicate balancing act. But, by using strategic placement you can find the best of both worlds and create a year-round energy-efficient greenhouse. Left: This is our tri-wall clear polycarbonate. The center layer creates 2 air pockets for insulation. You can see polycarbonate sheets don’t come with end caps: the air pockets are exposed. To prevent moisture and and dirt from accumulating inside the material you need to install end caps. Ask us for sourcing and pricing information. 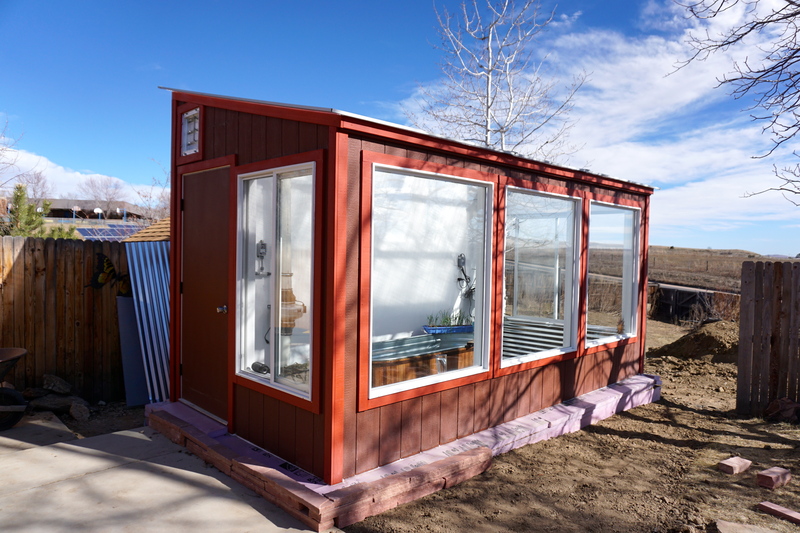 Solar greenhouse design – and passive solar design in general – relies on the premise of strategically controlling light and heat gain. 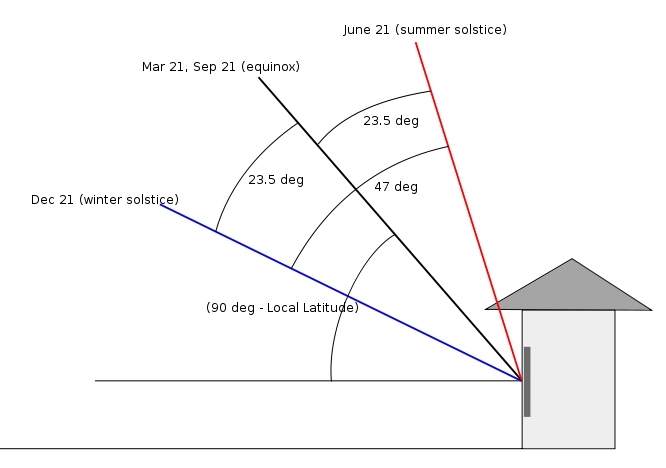 Namely, you want to maximize light when it is absolutely needed (the winter) and reduce light when it is abundant and creates too much heat (the summer). Use a high light transmittance glazing, like clear glass, on vertical south facing surfaces. (see more pictures of this design here). You can use some combination of the above – i.e. using glass panels and angling them to enhance light penetration – but be careful… glass will then be exposed to falling elements and hail and could shatter. Use laminated or tempered glass. In the summer, you have just the opposite problem: for most climates with hot summers there can be too much light which creates excessive heat. Because days are longer, light is less imperative at this time of year; most plants will do better with a light-diffusing glazing that has a lower light transmittance. Thus, in most climates greenhouses do better with a lower light-transmittance glazing on the roof – the area that absorbs light in the summer. Remember that in the summer light comes in at a high-angle. 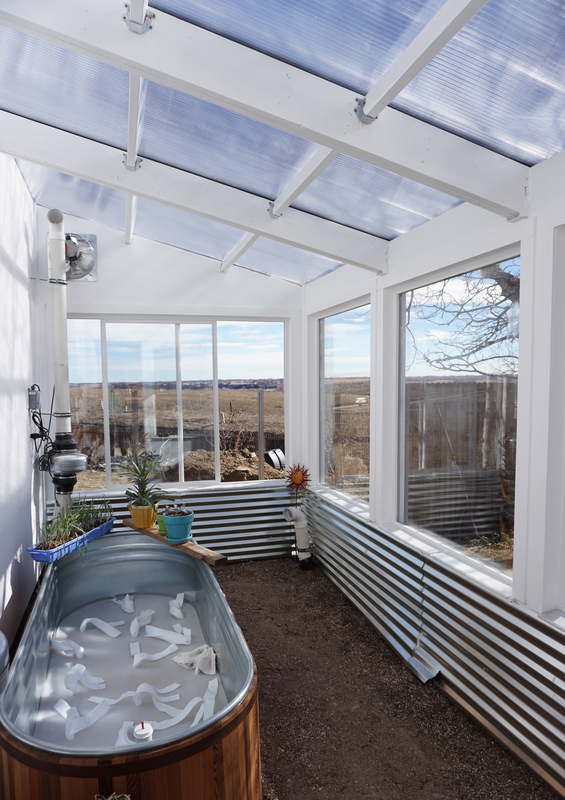 At Ceres, we recommend a tri-wall polycarbonate plastic or thicker material, with a light transmittance of 77% and an r-value of 2.6 per inch (You can see a video of this installed here). The roof is the biggest area for heat loss in a solar greenhouse, so using a thicker, more insulated material helps cut back on heat loss in the winter. Plastic films are the cheapest, but have the shortest lifespan. They are easily torn off in wind storms or heavy snow events. 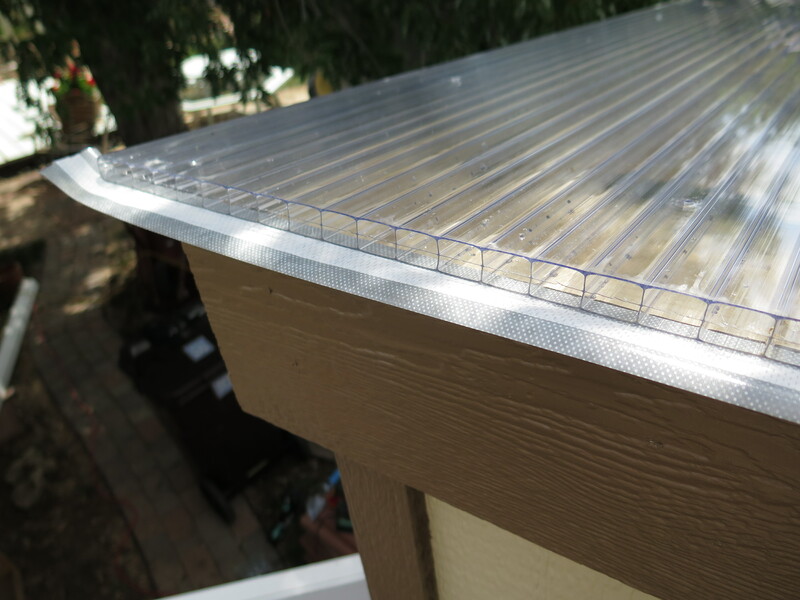 Rigid plastics like polycarbonate and clear fiberglass are hail proof and can tolerate higher wind loads and snow loads. 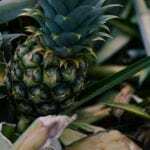 Their downside is that they are suscepitlbe to yellowing with continued sun exposure: after about 10-15 years most plastics begin to yellow and require replacement. Glass is great on vertical surfaces that are exposed to winter sun, but glass needs to be chosen carefully. Standard windows or replacement door glass is easily accessible, but can often have low-e or other coatings which will cut out a portion of the light spectrum that plants need. Glass is not a good option for large areas of the roof, or anywhere that can be damaged by hail. According to building code, it can also be damaged if less than 18” from the ground and less than 2’ from a door. Of course, there are many other options that influence your choice – building code restrictions, fire resistance, availability of the material in your area… Thus, we always recommend asking us before you make any choices on which glazing materials to use. A few suggestions upfront can save lots of time, effort and money down the road.